On the surface, London is a buzzing, modern metropolis - but underneath lies a hidden world, all but forgotten by the millions of people above. From ancient caves and preserved Roman remains to mysterious rivers and plague pits... 2,000 years of subterranean history. 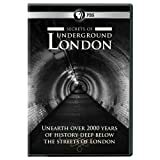 The special unearths historical locations such as the London Silver Vaults beneath Chancery Lane and Prime Minister Winston Churchill's bunkers - where he conducted his strategic plan to win the war - directly under Westminster.